Planting Corn in June and July! – What can you expect? Unprecedented rainfall continues to cause flooding and ponding leading to problems for corn establishment on 5 to 10% of planted acres in southern Wisconsin. Flooded and ponded areas have existed long enough now so that plants have been killed and areas need to be replanted. Most planted acres are still in good shape, but fertilizer and herbicide treatments need to be applied as soon as possible since the majority of the crop is at the V4-V5 stage and lay-by (V-10) will be occurring within the next two weeks. What is difficult to predict is the health of plants on the fringes of ponded areas in a field. These saturated areas have likely had N leaching and denitrification as well as impacts on plant health that will show up later in the life cycle. For areas of fields that have been killed by flooding or ponding the following guidelines should be considered. Corn can be planted for grain until June 1st-5th in northern Wisconsin and until June 10th in southern Wisconsin. Risk has increased from earlier planting dates and is great as average yield with increasing downside risk and frequent yield extremes caused by the environment. After June 10th, the only viable grain option is soybean until the last week of June. Corn can be planted for silage uses until about June 24th. During the last week in June, the objective of growers needs to change from planting crops for grain and silage production to emergency dry matter production. Finally, consider whether a crop should be planted at all? The best decision may be to fallow the land and control weeds. 2003/emergencyforage.htm). These results indicate that corn can be good emergency forage when planted in June and July. We conducted experiments during 2005 and 2006 to determine what could be expected by planting corn in June and July. Three corn hybrids (brown midrib, full-, and shorter-season) were planted on five different dates from April 28th to August 1st at Arlington, WI. The 2005 growing season had a killing frost on October 26th, which was three weeks later than normal. Seasonal dry matter production after planting during July ranged from 0.7 to 7.5 Tons DM/A while the same hybrids planted April 28th to June 1st produced 8.7 to 10.0 T DM/A (Table 1, below). Milk per acre is significantly lowered 92 to 17% to levels ranging from 2,300 to 24,000 lbs milk/ A for planting dates in July. 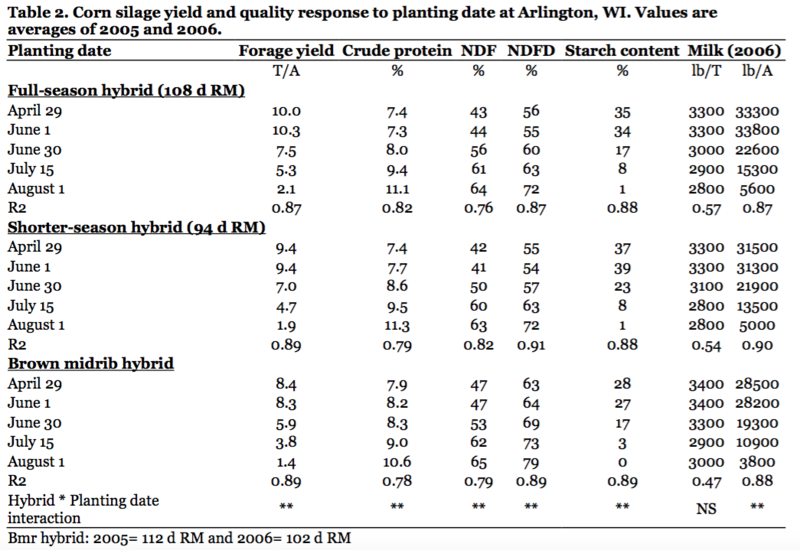 Crude protein, NDF and NDFD increased with later planting dates. Although, little starch content was measured in later planting dates, overall milk per Ton tended to decrease slightly. Thus, relatively small changes in Milk per ton occurred during planting dates in July with levels ranging from 2600 to 3200 lbs milk/T, which was a 16 to 22% decrease from corn planted April 28th to June 1st. 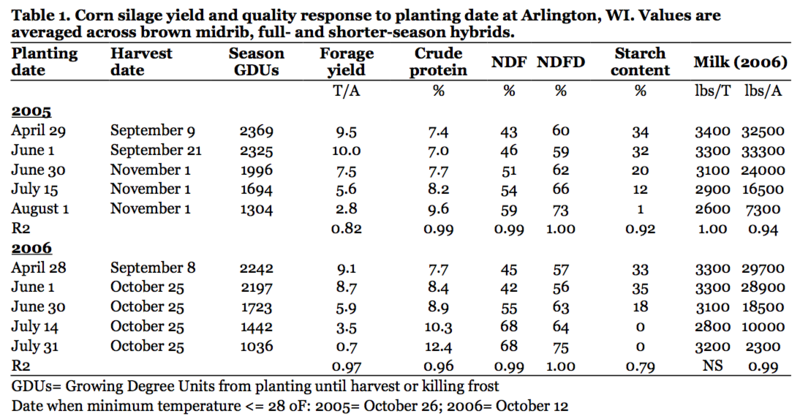 Full-season hybrids produced the greatest dry matter yield and Milk per acre when planted during July (Table 2, below). No significant interaction among corn hybrid types was measured for Milk per Ton, although brown midrib hybrids tended to produce the best quality. Corn can produce significant dry matter yield when planted during July, but the amount produced depends upon when a killing frost occurs. Growers need to check on options available from their insurance companies before taking action and planting corn in late June and July for emergency forage. Herbicide labels must be adhered to before switching to other crops. A small amount of fertilizer may be justified in replanted areas. There is no guarantee that flooding and ponding will not occur again later during the growing season.